The Black Press lost one of it’s most celebrated warriors when George Curry, veteran journalist and former Editor-In-Chief of the NNPA News Wire, died from an apparent heart attack on Saturday, August 20. Curry was 69. He passed away in suburban Mary­land, just outside of Washington, D.C.
“On behalf of the National News­paper Publishers Association (NNPA), we are all saddened and heartbroken by the sudden passing of one our most admired, respected, and gifted colleagues, George E. Curry,” said NNPA Presi­dent Dr. Benjamin Chavis. “Black Am­erica, and in fact millions of African people all over the world, had come to know George Curry as a fearless scholar and writer who used his pen and wit to aggressively advance the cause of freedom, justice and equality for Black people and for the whole of humanity. It’s hard to believe that Curry, who led the NNPA as Editor-In-Chief of its news wire from 2003 to 2007 and then from 2012 to 2015, has died, said Washington Informer Publisher and NNPA Chair Denise Rolark Barnes, who called Curry a giant in the journalism profession. “As publisher of ‘The Washington Informer,’ I admired George's leadership as Editor-In-Chief of ‘Emerge,’ the preeminent monthly news magazine targeting issues impacting African-Ameri­cans,” Rolark Barnes said. “George’s uncompromising journalistic leadership delivered on Emerge’s promise to deliver edgy, hard-hitting, intellectual, well-written and thoroughly researched content that attracted national attention and left an indelible mark on the lives of many. “As a member and now chair of the National Newspaper Publishers Association, I was honored to carry George’s weekly column in ‘The Washington Informer’ and to work with him while he served as Editor-In-Chief of the NNPA News Wire. George provided so much of his time, energy, wisdom and incredible journalistic genius to the Black Press,” she said. Freddie Allen, the managing editor of the NNPA News Wire, called Curry an icon in the Black Press and said that his legacy of mentoring young journalists will bear fruit for many years to come. Recently, Allen and Curry were part of a Black media delegation that worked with the Black AIDS Institute to cover the 2016 International AIDS Conference in Durban, South Africa. Curry was a consummate journalist with integrity as his mantra, said Dorothy R. Leavell, publisher of the Crusader newspapers in Chicago and Gary, Indiana. “We shall miss this voice of reason and thought-provoking columns full of researched facts. It was just the week of August 13th that George wrote a column titled ‘Even Funerals Are Not Family Re­unions Anymore.’ He used his family as an example of the loss of closeness that he had enjoyed during his childhood and early adult life and bemoaned the fact that at his cousin Charlene’s funeral the week before that closeness was no longer there,” Leavell said. "George Curry was the consumate professional,” said Los Angeles Sentinel Publisher and Former NNPA Chairman Danny J. Bakewell Sr.
“Not only was he an award winning journalist and supporter of The Black Press, but he was a man driven by the understanding of the importance of the Black Press within our community. He understood and promoted its history, its significance and its power. George was not only a personal friend but I will forever be indebted to George for all of his work in helping elevate NNPA during my time as Chairman. “I am heartbroken to learn that Mr. George Curry has passed. He has been a beacon for so many and a pivotal voice among black publishers. His strength and pursuit for the truth will carry on in the lives he touched,” said NABJ President Sarah Glover. The news of Curry’s death not only reverberated throughout Black media, the loss was also felt in the halls of government. “George Curry was a good friend and true journalist who understood his responsibility to the African American community and the power of his words to create impactful change,” said Congress­woman Maxine Waters. Democratic Presidential nominee Hillary Rodham Clinton even took a moment from her busy campaign to express her thoughts about Curry, whom she called a friend. The Rev. Al Sharpton called Curry a “trailblazer” and said he was “saddened beyond words” at news of Curry’s death. In 2003, Curry was named “Journalist of the Year” by the National Association of Black Journalists and he’s also on NABJ’s list of the Most Influential Black Journalists of the 20th Century. 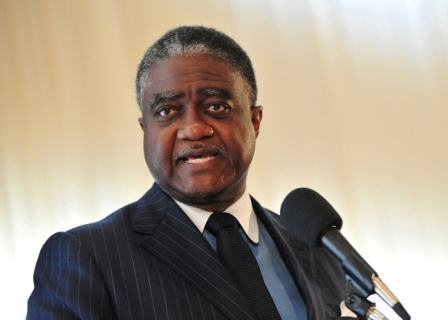 “We pledge to keep the journalistic genius and spirit of George Curry alive in all that we will do in the future to sustain the liberating and empowering voice of Black owned newspapers and media companies,” Chavis said.